I got a message from Windows saying I do not have the proper authorization. What should I do? If you have TO3000 v8 or 9 and you do not want upgrade the software, due to some specifics of Windows 7 and Windows Vista, to properly run TO3000, you need to run the program with advanced or administrator rights. 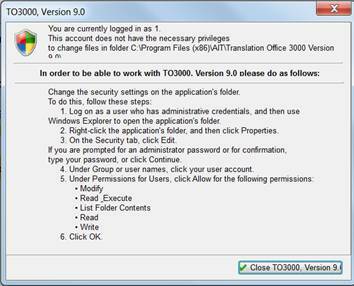 For this, after you have installed the program, right-click on ‘Translation Office 3000, Version 9.0’ shortcut on your desktop and in the appeared menu click ‘Properties’. 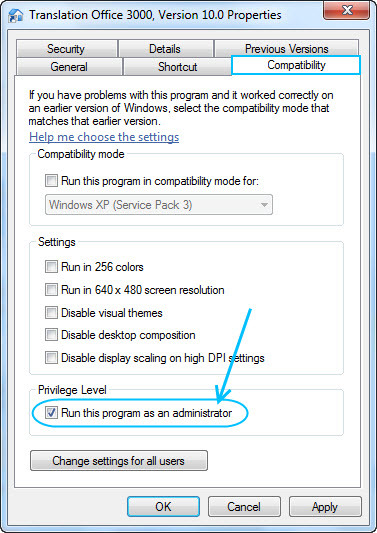 Then go to ‘Compatibility’ tab, select the ‘Run program as an administrator’ checkbox and click the ‘Ok’ button (see below).